The main source for the legends about the Pre-Roman Fassa valley is H. de Rossi’s collection, who dedicates a couple of chapters to what he obtained from an aged informant who remained anonymous. I’m summarizing here the Ladinian texts and their Italian translations, usually less developped. However, the remarkably detailed informations we can derive from them don’t easily match with the archaeological data available today. We can observe that some doubts can be cast on the validity of the single source from which de Rossi seems to have collected his witnesses. In the place where now St. Juliana’s church stands, there once was a majestic castle with three towers, that were the symbol of the three allied valleys: Fassa, Ega, Livinallongo and St.Nicholas (!). The walls were massive, and several war implements were preserved in their tunnels. Loopholes were the only thing that could be perceived from outside. The biggest tower, that of Fassa, was painted yellow and green, Vigo’s colours. Under a cover (kuert) rising on four stone pillars, the sacred fire burned perennially. Several circular walls had been erected for defense. Within them, farming was forbidden, as well as planting or removing trees: it was a sacred place, where the dead were buried. St.Juliana's church rises on a magnificent terrace, 15 minutes of walk above Vigo di Fassa. The church dates to the XVth century, but is was erected over much older buildings. The first church appears as having been mostly built of wood and can be dated to about the Xth century. Remains dating to the Iron Age, (IVth century B.C. ), referred to a cultual deposit, have also been retrieved. No trace was found (up to now?) of a castle, or better of a castelliere [circular dry stone fortification], as well as of any neighbouring dwellings. Notice that the valleys symbolized by the three towers are actually four, like the three musketeers; evidently, one of them is spurious. The St.Nicholas valley (mentioned in the Ladinian text, not in its Italian translation) seems too small for having been able to feed a population as numerous as the other ones, at least in the recent past; however, it debouches into the Fassa valley pretty close to Vigo; the Ega valley is close by too, while the well-populated Livinallongo is geographically much farther away, and politically it also was so until year 1027, when the bishop of Bressanone gained control of them all. I’ve got the feeling that in proto-historical times the three valleys were Fassa, Ega and St.Nicholas; in the Middle Ages, having the last of them declined since long, it was replaced by Livinallongo, maybe on the purpose to underline their ethnical and linguistic brotherhood and perhaps also to help burying the bitter attritions of the past forever. In the castle, the commander had his residence. A popular assembly assigned each freeman a red dot or a red star for every outstanding feat he had performed; the man who had most, was nominated commander at war and judge in time of peace. The place where the castle should have risen is named today Ciaslier. This passage seems to specially exhalt the absolute democraticity of the commander’s choice. The credibility of the legend is, however, wholly to be proven. The name of the place, that evidently means castelliere, is repeated (in the form Castelir) at the Castelliere of Bellamonte, in the nearby Travignolo valley, that was inhabited during the Iron Age and perhaps in the Bronze Age too. The castellieri, strongholds or fortified villages built on hilltops and basically defended by a broad dry stone wall, are typical e.g. of Istria and Venezia Giulia; the placename is present also elsewhere in the Dolomites. Remark that the defensive structure of a castelliere is completely different from that evidenced at Sotciastel in the Badia valley (a ditch and an earthwork crowned by a palisade). .
Out of the walls, there was a large village provided with four water cisterns, two of which are still visible, but one day it was buried by a landslide. Its inhabitants moved lower, where today’s village still stands. Their homes were single-floored huts, with no windows and no chimney They were round, built of dry stones whose joints were plugged with moss and earth. Their roof consisted of branches and leaves. Their entrance was so low as to compel people creeping in on fours. In the middle they had a stone hearth which was never extinguished, because to light it they must rub two pieces of wood together, until a spark was ignited. Smoke could only get out through the door. Along the wall there were seats built out of large stones. The village was named Chiusil. The structure of the dwellings described here doesn’t match at all that of the Pre-Roman hamlets in the Fassa valley of which we still have a few remains (Doss dei Pigui, Pian dei Crepei), where huts were wooden, square-shaped and built with the block-bau technique (beams in a rectangular layout, with extremities fitted into each other, in overlying layers). If we apply the dry stone technique recounted by de Rossi to the fortress and its towers, the picture that appears to our mind is that… of a nuragic village! There is a second legendary hint to a circular dry stone fortress in the Fassa valley (Kindl, 1997): it refers to the upper Mortic valley, where a military leader known as Molares is told as having long fought against a foreign army commanded by… Dolasilla (! ): obviously just another case of homologation of different characters over the same archetype. I never heard anything about the actual existence of the remains of such a fortress. Of course, it may happen that natural stone heap structures are mistaken for the ruins of ancient buildings. Why does the witness recounted by de Rossi, be it or not the echo of a really popular tradition, tell of something that in Fassa seems never having existed? Maybe someone, in a relatively remote past, had seen the still standing remains of Bellamonte (or other places) and mentally applied the same building concepts to the then legendary village? Sure he couldn’t invent them out of his own mind, since all those details are absolutely realistic. Is the village just buried where nobody tried digging it out yet? Were both techniques in use in the valley, maybe at different times? There’s still a lot of room for new researches, both archaeological and upon folklore. The festival was hold under a large pitch tree during a “regola”, a general assembly of the people, which lasted eight days, together with the allies (Fodom [=Livinallongo], Ega, St.Nicholas). Every day at sunrise men assembled to deliberate about justice and common defense; the military leaders of each valley were nominated and dots and stars were painted on the warriors’ shields. After midday they blowed a horn and at this signal people were allowed to climb up. Everyone hurried to be able seeing the sacrifice. Two or three veals were killed, then they danced and sang and prayed; competitions and games were held. A straw puppet was burnt; this tradition went on after Christianization also, but with the puppet only and with no altar. Now a procession is hold in St. Vito’s honour, but in Carnival the straw puppet is still burnt. They say that on the Col de Me a Christian preacher was also massacred. The description of the pagan festival, certainly a rite for the beginning of the agricultural year of extremely old tradition, is basically credible, as more so as it seems having lasted very long (probably it was only banished by the Counter-Reform). The language of the song, that can be compared with other fragments remembered by the Fassan legends, is a very interesting proto-Ladinian, where several words seem to be in a very corrupted Latin. De Rossi himself was in great trouble transcribing it (several versions exist, all of which differing for some small details; see U. Kindl’s notes in H. de Rossi, 1984). The second strophe leaves me even more doubtful. “Tinarez” seems to be an invocation to two distinct deities, Tina and Rez; for the former an assonance with the Etruscan god Tinia has been invoked, for the second with the Venetic-Rhaetian Reitia, who was venerated at Este (again U.Kindl). “Peppe” (or “pepe”) sounds quite mysterious to me. “Tor pikol coà”, maybe literally “take a small brood”, might be a reference to a sacrifice of young animals to the gods, also because “n barat” should mean “in exchange”; les bot is unclear in itself, but in other versions it is replaced by bez or tos, that should both mean “boys” and so “children” (?? ), while “taf e slap” should be something alike to “food and drink” and “garà” certainly means “available”. Food and drink available for us”. Notice that both strophes appear as having more or less the same meaning; the former shows a majority of words derived from Latin, while those of the latter appear to be of mostly Rhaetian origin. May it be the repetition of two invocations having the same general meaning, but different origin? When Romans arrived, Fassans opposed a stubborn resistance. Many preferred suicide to defeat; women, who resisted longer than men, when other projectiles were over, threw their children into their enemies’ face. Before fleeing into the mountains, the Fassans burned everything, so that “Munez”, the infamous Roman leader, was only left with smoldering ruins. U. Kindl remarks that this “legend” is really taken from the recount of the Roman annalist Anneus Florus, who didn’t refer it to the Fassa valley, but to peoples of the Noricus in general) and therefore it is of learned derivation and no authentic popular tradition. “Munez” might be intended to be Lucius Munatius Plancus, a great general and illustrious Roman politician, a faithful follower of Caesar first and of Octavianus later, who, among other honours, was governor of the Galliae, where he founded Lyon. Munatius in 44 B.C. 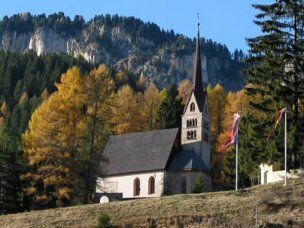 defeated the Rhaetians of the upper Rhine, but it is rather doubtful that he personally took care of conquering the Fassa valley. This too might only be a learned tradition. By the way, history confirms however the presence of other minor representatives of the Munatii family in the Roman armies engaged in the Alps. For the Roman conquest of the Fassa valley, see also what said in > Analysis >The Fassan trilogy and in > Essays> The Trusani.